Falkirk Football Club have released a statement claiming that the closure of their youth academy helped stop the club from going bust. In a 2,573 word statement released online, the club detail the finances behind the academy being closed, and say they would have “run out of cash” in April of this year, if not, in part, for the savings made after the academy was scrapped. 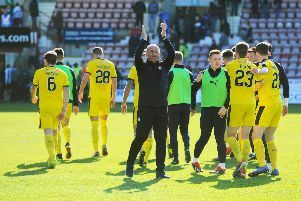 Falkirk announced in December of last year that the club would be going down a different route, and getting rid of the youth academy – which had become a fabric of the club. The finances behind the decision were revealed by the club in the statement: “A full review in 2017 showed ever increasing costs related to our development of young players. “The total cost at that time was £340,000 per year. This would rise to £433,000 in the first year and up to £467,000 per year by year three. The dependance on selling players is highlighted, with Stephen Kingsley’s sale said to have been responsible for 41% of the club’s total transfer revenue since 2011, before the club write that they are breaking even for the first time ‘in a number of years’. “We are operating with a break-even budget that is not reliant on player sales or cup run revenue to plug a hole in the finances. On where the future generation of Bairns will come from, the statement adds: “An Academy is not able to produce year on year players who are either first team ready or sellable. The statement, which answers eighteen questions the club believe to important to supporters and offers the chance to email Margaret Lang, goes on to answer questions about former manager Paul Hartley and the budget that the new management team will be given for the remainder of the campaign. £60,000 was paid out to terminate contracts early when Hartley and members of his backroom staff left the club last month, with the statement adding that the new management team will be supported with recruitment despite the budget being damaged.